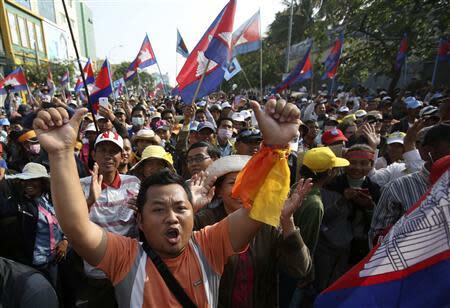 PHNOM PENH (Reuters) - Tens of thousands of Cambodian opposition supporters, backed by striking garment-factory workers, rallied on Sunday to demand long-serving Prime Minister Hun Sen step down and call an election. 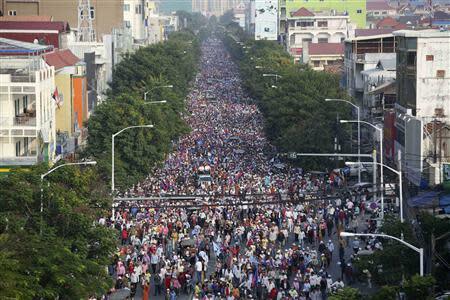 The garment workers have in recent days joined the opposition protests to press their demand that the government raise the minimum wage to $160 a month from $95, as recommended on December 24. "Hun Sen and his illegal government can hear us, they can't ignore us, the people show their will for change," Sam Rainsy, leader of the main opposition Cambodia National Rescue Party, told the rally in a Phnom Penh park. "We demand that Hun Sen to steps down and a new election," Sam Rainsy, a former finance minister, told the crowd, some of whom have been camping out in the park since December 15. 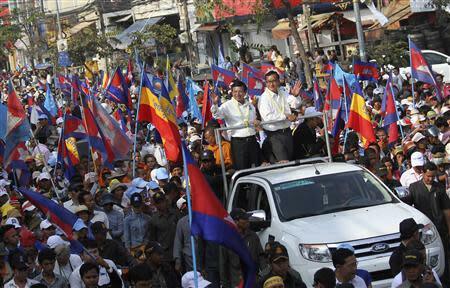 Hun Sen's long-dominant Cambodian People's Party won a July election but with a reduced majority. It has rejected opposition complaints of vote-rigging. Hun Sen, who has been in power for 28 years, has ignored opposition demands for an investigation into the election and says that he will not resign or call a new election. Under Hun Sen, Cambodia has been transformed from a backwater scarred by the "Killing Fields" rule of the Khmer Rouge, into one of Southeast Asia's fastest growing economies, helped by a burgeoning garment industry and growing political and investment ties with China. But his authoritarian rule has earned the condemnation of rights groups and that, along with widespread corruption, has alienated many voters. Many of them have now come out onto the street in a sustained show of defiance that would have been almost unthinkable before the election. Cambodia's garment manufacturers, meanwhile, have for years enjoyed low wages and relaxed labor conditions. But Chea Mony, president of the country's biggest labor union, the Free Trade Union, told Reuters that more than 200 of 600 factories had closed because of the strike for higher pay. "The new minimum wage is not acceptable to workers so there must be talks on the demand for $160," Chea Mony said. Garment and shoe factory representative said the strike was damaging the industry. "The Garment Manufacturers Association in Cambodia would like to inform all stakeholders that our industry is unable to continue operations given the current situation," association Secretary General Ken Loo said in a statement.